These perfectly easy canapés can be made ahead of time, are served cold, and are simply perfect for a fancy Spring or Summer celebration! With homemade pesto, olive tapenade and chive cream cheese, you’ll create the most irresistible, colorful and gorgeous little gardens of roses and veggies on your appetizer tray! They’re perfect for Easter, weddings, bridal showers, baby showers… just about any bright, colorful, happy affair! I made these precious canapés for a dinner party recently, and they were the stars of the evening! I prepped all my ingredients in about 15 minutes, and had the canapés all assembled in another 20 minutes! This recipe calls for peppered salami to make the roses, but you can also use just about any deli meat that you like! I used prosciutto at my dinner party, and they just looked so pretty! You can also substitute thyme for chives as well! 1. Use a very sharp, thin knife to cut your veggies. The more precise you can cut your vegetables, the prettier they’ll look. A dull knife will make them look a bit sloppy, so sharpen your paring knife before you start! Don’t do it! Make your own instead! It’s 1000% better than anything you can get in the store, trust me. Store-bought pestos are often full of preservatives and are terribly oily. Fresh pesto is so dreamy and the texture is perfect for these canapés. It’s not oily at all. It’s soft and a perfect texture to secure all the veggies on top. You’ll find the very simple recipe below. 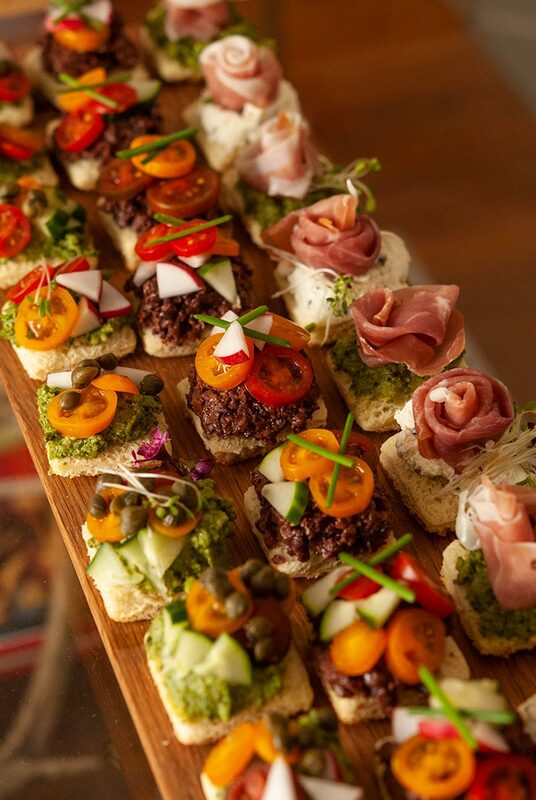 These canapés are tastiest (and prettiest) when they’re freshly assembled, so if you won’t have time to both prep and assemble before your guests arrive, make the tapenade and pesto ahead of time, storing them in containers with lids. 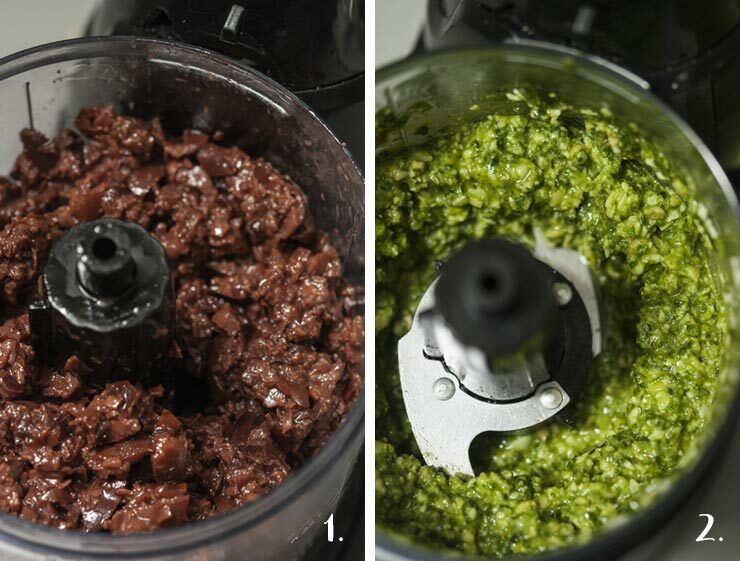 The tapenade can be made a whole week ahead of time, and the pesto can also be made at least 3 days ahead of time, or frozen for up to 2 months! Also make sure to chop your little veggies up to 12 hours in advance, too, and store them in a sealed container as well. Then, a half hour before your guests arrive, simply cut your bread with a cookie cutter and start assembling. Easy as pie! What’s the difference between a canapé and an hors d’œuvre? A spread like we’re making – tapenade, pesto, cream cheese, etc. A topping like the tiny vegetables we’re going to add. A garnish like an herb or even an edible flower. Sometimes, it will even have an extra sauce of some kind on top like sour cream, a mustard, hot sauce – just something to add one more exciting pop of flavor on top of all the other exciting textures and flavors. Suffice it to say, it makes for a very entertaining bite. 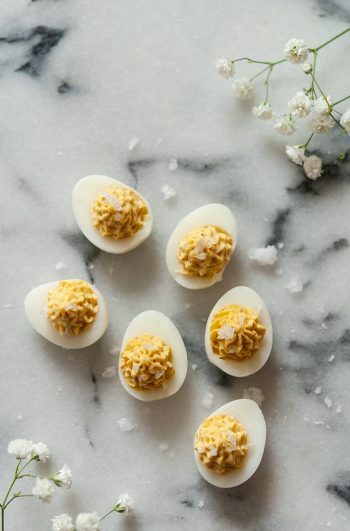 How do I make these Canapés ahead of time? They’re best when freshly assembled, but if you don’t have time to do that before guests arrive, assemble them up to 2 hours before the party and store them in a container with a secure lid in the fridge. You don’t want to make them any more than 2 hours in advance because the bread will start to become a bit soggy. What do I need to make these Canapés? 1. Make your olive tapenade. In a food processor, simply add ¾ cup of pitted kalamata olives and process for about 15-20 seconds. Watch it carefully. You don’t want it to be a consistency of pâté, It’s nice when it has a bit of texture. 2. Make your pesto. In a food processor, add 1 cup of fresh basil leaves (without stems), 3 tbsp. fresh-grated parmesan cheese, 3 tbsp. olive oil, 2 tsp. white balsamic vinegar and 2 tbsp. of pine nuts (or pepitas). Process until well-chopped and almost creamy. This should yield about 4 tbsp. of pesto. Make sure to cover your pesto while you prepare your other ingredients or it will start to dry out. 3. Make your bread base. Use a cookie cutter to cut perfect squares or circles out of each slice without the crusts. You’ll want to cut 24 perfect little pieces. 4. Chop your radishes. You’ll only require about 3-4 small-medium size radishes for all the canapés if you cut them into nice and tiny triangles as shown. 5. Slice your cherry tomatoes. You’ll only require about 8 tomatoes. Choose the tiniest ones in the bunch and slice them nice and thin. 6. Slice your Cucumber. You’ll only require about 4-5 slices of cucumber. Slice each piece into tiny triangles, the same as your radishes. 7. 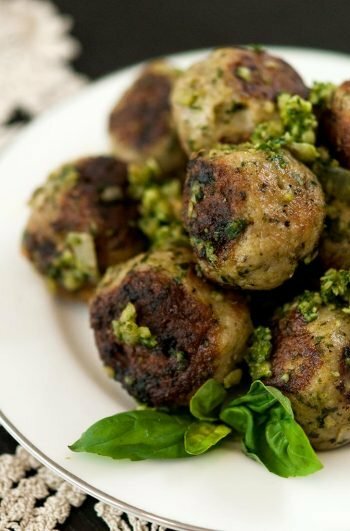 Create your pesto canapés. Add a small amount of pesto to the breads with a knife. 8. Top them carefully with your veggies and a few capers, and line them up on your tray. 9. Create your tapenade canapés. Add a nice helping of tapenade to the breads with a small spoon or knife. 10. Top them with veggies and a small sprig of thyme (or chives) and line them up on your tray. 11. Make your beautiful rose canapés. Fold your peppered salami once, then twice on the bottom as shown. 12. Simply roll your salami into a rose. It might come undone a little once it’s rolled, but don’t worry. The cream cheese on the bread will hold it in place. 13. Add a nice helping of chive cream cheese to the remaining breads. 14. Place a salami rose in the center. 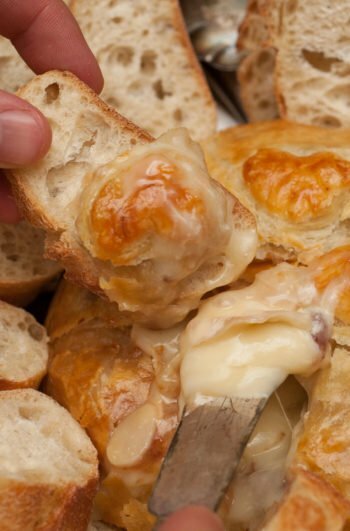 Add a few sprouts to the side of the rose by pressing them into the cream cheese. Line them up on your tray. Do your best to contain your giggles and swooning as you place your gorgeous canapés on the appetizer tray. I have to admit, I was so enamored with these that I had to stop myself from staring at each new one I created, and keep going. I had them done just in the nick of time before my guests walked in the door! These perfectly easy canapés can be made ahead of time, are served cold, and are simply perfect for a fancy Spring or Summer celebration! Make your olive tapenade. In a food processor, simply add ¾ cup of pitted kalamata olives and process for about 15-20 seconds. Watch it carefully. You don’t want it to be a consistency of pâté, It’s nice when it has a bit of texture. Make your pesto. In a food processor, add 1 cup of fresh basil leaves (without stems), 3 tbsp. fresh-grated parmesan cheese, 3 tbsp. olive oil, 2 tsp. white balsamic vinegar and 2 tbsp. of pine nuts (or pepitas). Process until well-chopped and almost creamy. This should yield about 4 tbsp. of pesto. Make sure to cover your pesto while you prepare your other ingredients or it will start to dry out. Make your bread base. Use a cookie cutter to cut perfect squares or circles out of each slice without the crusts. You’ll want to cut 24 perfect little pieces. Chop your radishes. You’ll only require about 3-4 small-medium size radishes for all the canapés if you cut them into nice and tiny triangles as shown. Slice your cherry tomatoes. You’ll only require about 8 tomatoes. Choose the tiniest ones in the bunch and slice them nice and thin. Slice your Cucumber. You’ll only require about 4-5 slices of cucumber. Slice each piece into tiny triangles, the same as your radishes. Create your pesto canapés. Add a small amount of pesto to the breads with a knife. Top them carefully with your veggies and a few capers, and line them up on your tray. Create your tapenade canapés. Add a nice helping of tapenade to the breads with a small spoon or knife. Top them with veggies and a small sprig of thyme (or chives) and line them up on your tray. 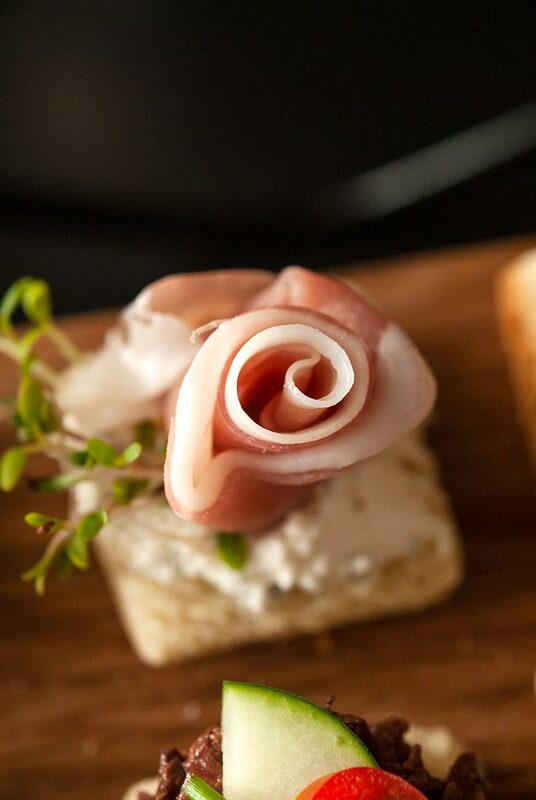 Make your beautiful rose canapés. Add a nice helping of chive cream cheese to the remaining breads. Fold your peppered salami once, then twice on the bottom, then simply roll your salami into a rose. Place it in the center of the bread and cream cheese. Add a few sprouts to the side of the rose by pressing them into the cream cheese. Line them up on your tray. They can be assembled up to 2 hours before serving if they're stored in a container with a secure lid in the fridge. You don’t want to make them any more than 2 hours in advance because the bread will start to become a bit soggy.